BREAKING NEWS SPECIAL: Seen Sridevi's All Heart Pic With Husband Boney Kapoor Yet? 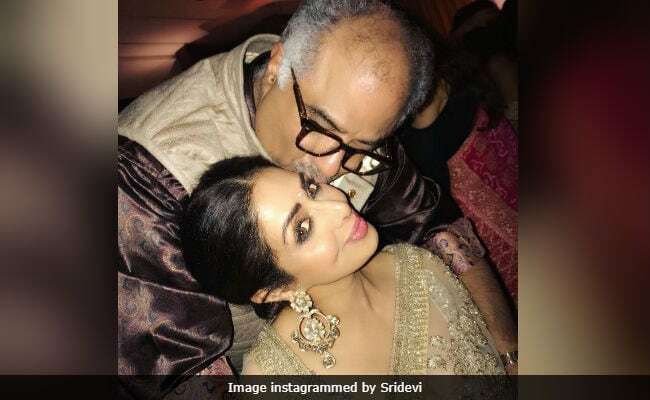 Seen Sridevi's All Heart Pic With Husband Boney Kapoor Yet? She also posted another picture of herself and Boney Kapoor, this time captioned: "My number 1." For this Diwali party, Sridevi opted for a Manish Malhotra sari and a spectacular Gems & Jewels palace kundan and emerald necklace. Sridevi summed up the festive week's fashion of the Kapoor ladies by posting few more pictures of herself, and her daughters Jhanvi and Khushi (both in Manish Malhotra couture). Sridevi was last seen in MOM, which was produced by Boney Kapoor. Jhanvi is gearing up for her Bollywood debut too and is often spotted outside a dance rehearsal studio in Mumbai. Jhanvi's debut is being handled by Karan Johar and it is reportedly the Hindi remake of Marathi film Sairat. Sridevi is Boney Kapoor's second wife. He was earlier married to Mona Shourie and together they had two children - son Arjun Kapoor (also an actor) and daughter Anshula.